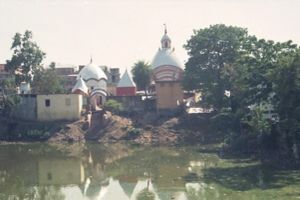 Tarapith is a temple town in Birbhum-Murshidabad. It is a major Hindu pilgrimage centre and several thousand devotees visit the temple every day. According to one popular belief, an insulted Sati, the wife of Lord Shiva, sacrificed herself at a yagna (fire worship ritual) which was being performed by her father Dakshmaharaj. Angry with this incident Lord Shiva started the Tandava Nritya (Dance of Destruction). In order to prevent destruction of all creation, Lord Vishnu used his Sudershan charka (wheel) to cut the body of Sati into several parts. Sati's body was scattered all over what is presently the Indian subcontinent. There are 51 such holy spots where temples have been erected and they are called Pithas or the Soti Pithas. 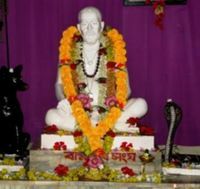 Some of the Pithas are in West Bengal. The most popular of them are Kalighat (in Kolkata}, Bakreshwar. The Name Tarapith Originated Because Of Eye Ball(Tara) Of Sati Fell Here. But according to Puran, Tarapith is not a soti pith, it is a shakti pith. Eyeball of Sati didn't fall here. Three eyes of Sati fell near Karachi (Pakistan). The name of that place is Shorkora or Korobirpr. It is believed that the eyeball of Sati fell down at Tarapith. In Bengali, the eye ball is called 'Tara' and that is why the name of the village was changed from the earlier Chandipur to Tarapith. It is said that in ancient times Saint Bashistha attained his divinity by meditation under a Simul tree on the bank of river Dwaraka. He attained his divinity by worshipping the Goddess Sati or Tara (in the form of Kali)and sitting on tha panch mundi ashan or the sitting place surrounded by 5 skulls of different animals,like human,owl,elephant,black snake and monkey. That Simul tree is no more there and river Dwaraka has moved away. Subsequently a number of saints like Saint Bamakshyapa (19th century devotee) and Kamalakanta (18th century devotee, who composed many songs, still sung) came here to worship the Goddess for their spiritual salvation. The old temple of Goddess Tara is somewhat damaged. The present temple with eight roofs was built in 1225 by one Jagannath Ray of Mallarpur village. On the main gate of the temple the statue of Goddess Durga and her full family are carved. On the left the war of Kurukshetra (Mahabharata) and on the right stories from Ramayana are depicted. By road - One has to travel along the Panagarh Morgram expressway. 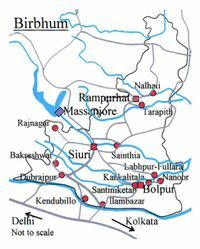 If one is travelling from Siuri, then one has to turn right just before entering Rampurhat and travel around 11 km to reach Tarapith. By rail - the nearest station is Rampurhat, Burdhawan, Asansol. Normally one has to get to Tarapith in a hired car/ taxi/ bus. Thereafter, it is small town and one can walk around. Cycle rickshaws are available. Bamdev Sangha Asram - a few yards from Tarama temple.You can see a graceful environment at Bamdev Sangha Asharam.At first Sri Bamakhapa idol established by Maharshi Sri Susil Kumar Bandhopadhaya in Bamdev Sangha Ashram. There are many shops trying to attract attention of the pilgrim-tourists. A good book is available at Bamdev Sangha Ashram called "Tarapith Bhairav" by Maharshi Sri Sushil Kr Bandopadhaya.You can buy many spiritual books from here.For any other information please contact Sri Kalayan Kr Ghosh(secretary of Bamdev Sangha)phone No:-9830660504.Bamdev Sangha Office Address:- 8,Pramanick Ghat Road,Baranagore,Kolkata=700036 & phone no:- (033)2556-9696. There are plenty of moderate eating houses serving standard Bengali meals. No taboos on hard drinks but not available openly. It is better to carry one's own stock of hard drinks. There are around 350 lodges or hotels in Tarapith, mostly catering to budget tourists. There is nothing luxurious as this is a pilgrimage centre. There is no problem in getting a place to stay but many people get back to Rampurhat or move on to other places. Birchandrapur - a Vaishnab religious center with some old temples, is 8 km away. This page was last edited on 13 August 2018, at 08:08.